Home › Forums › Plugin Support › WP Project Manager Pro › The e-mails dont get send out..
Hi there all the e-mailtemplates dont get send when adding a customer or replying in a chat (all others dont work either). Can you please check the server settings. Make sure you have properly configured SMTP email settings in hosting server or you can contact with your hosting provider. What should i configure in my SMTP settings to make it work? Contact your hosting provider and try to get an assurance that emails are sending and receiving correctly from your hosting server. If sending and receiving email correctly then I will take a further step. Please let me know when done. I already did yesterday and all mails are sending oke except the ones from your plugin. 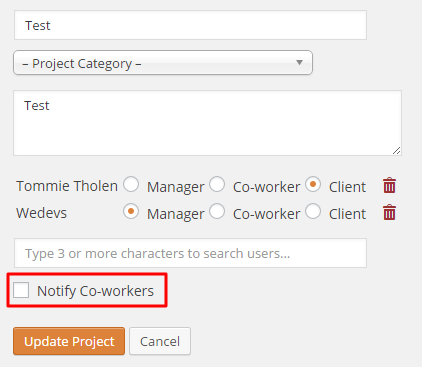 I think you had missed select to “Notify Co-workers”. But I can see mail are in my inbox when I create project, leave a message and assigned a new task. Can you check please and let me know the result. The topic ‘The e-mails dont get send out..’ is closed to new replies.